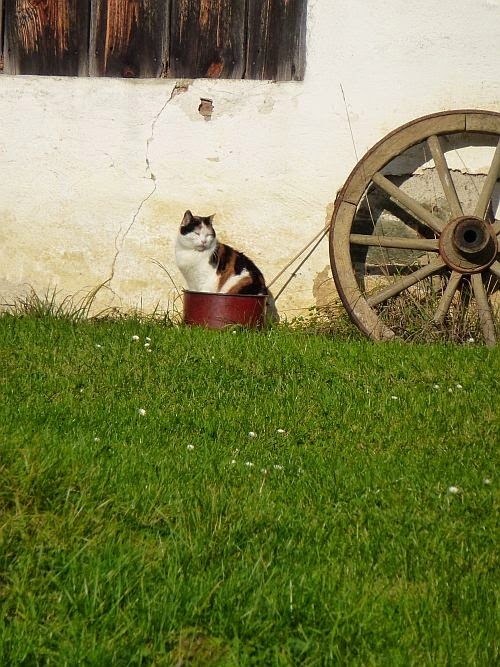 My new life in Burgenland: My Cat Has Gone Potty. Cats and dogs are the best comedians for sure. Those rare moments of genuine laughter are quite often caused by our pets. Aren't those droll actions they take the best elixir? Have you also noticed how much character our pets have? Only yesterday I was talking to a friend who was on her way to do the " Gassi Runde " ( German phrase for enticing your dog to transact business outside ) with her dog, and was again reminded of how fabulous animals are.
" Oh, are you still talking? Get on with it, I want to go already! " and believe me, I got the message. As you know, we inherited a cat with our house. To put it more correctly, Bob and I moved into her house and are sharing her space! The privilege of cuddling her is sadly still denied to us but we live in hope to crack the nod, hear the purr or feel the warmth of a cuddly feline body doing the figure eight between our ankles. Tigger's antics are priceless and Bob and I get so much enjoyment out of them and often a good laugh too. One of her most favourite treats is to watch me do anything to do with laundry. She has a laundry radar and pops her head out of her chambers as soon as she hears me shake out a wet shirt, sock or towel. Those are the rare moments when she comes closest to me. 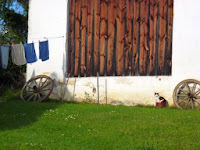 She is my most loyal spectator when I hang the washing on the line. Too cute. Well this week she upped the ante. Who knows where she was ( somehow I suspect she collects morsels at several neighbours too ) but she missed the whole laundry affair. Well, not a problem for Tigger. Bob called me to see how cute and slightly dotty she was. 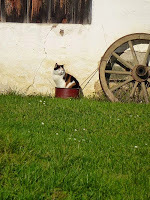 Now you get an idea why she perched and pretended to be a bit potty. She was so miffed that she had missed out on my hanging the laundry up, that she made sure to not miss me when I took it down. Of course it helped that this was also a sun kissed spot. Oh, our cat is the best!